Tokyo Otaku Mode™ (TOM) is pleased to announce that it is collaborating with All Nippon Airways’ (ANA) Japanese branding project “IS JAPAN COOL?” which aims to entice more international tourists to visit Japan. “IS JAPAN COOL?” is ANA’s campaign website (http://www.ana-cooljapan.com/) that transmits to the world the appeal of Japan by delving into various cultural aspects of Japan––such as cosplay, kawaii, and traditions––and destination appeals of cities such as Tokyo and Okinawa to once again increase travel demand to Japan, which has seen a big slump since the Great East Japan Earthquake of 2011. 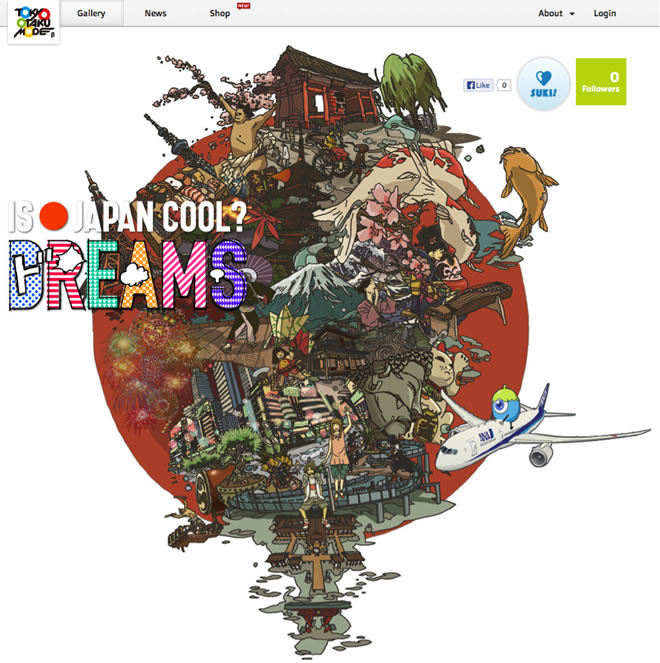 For this collaboration, TOM will set up a special page ( http://otakumode.com/sp/ijc_dreams ) on its website Tokyo Otaku Mode β (http://otakumode.com) to distribute the new content of “IS JAPAN COOL” called “DREAMS” that introduces to the world Japan’s anime, manga, and game culture. The content “DREAMS,” which was added to the “IS JAPAN COOL?” site on July 4, introduces to the world “artisanal techniques” that showcase Japan’s creative and high-quality anime, manga, and game culture. An example of this is the collaboration between ANA and “PES (Peace Eco Smile),” a project created by Toyota and Studio 4℃, that introduced anime, manga, and games to the world. Also introduced are the Fujiko F. Fujio Museum in Kanagawa Prefecture and the Mizugi Shigeru Road Museum in Tottori Prefecture. By introducing such content to TOM’s overseas users who love Japan’s unique culture that encompasses anime, manga, and cosplay, TOM aims to help enlarge the acknowledgment of “IS JAPAN COOL?” as well as stimulate international tourist travel to Japan. “IS JAPAN COOL?” was released in February 2012. Due to the vast decline in travel to Japan after the Great East Japan Earthquake of 2011, to first increase fans of Japan, the Japanese airline ANA began releasing sites and videos in the categories of “Tokyo,” “Cosplay,” “Kyoto,” and “Kawaii.” As a result of “IS JAPAN COOL?” and reactions from users worldwide, since its launch, roughly 70,000 people all over the world have visited the campaign’s site, more than 60,000 people from 150 countries participated in the airline ticket campaign, and the campaign’s videos on YouTube have been viewed roughly 1.2 million times. It is believed that due to this campaign, travel to Japan increased by 34.6% over the previous year, a dramatic increase of an estimated 8,368,100 people. This was also mentioned on Twitter by government officials, such as U.S. ambassadors and national tourism officials. Human evolution is represented by the history of mobility. Cars bring our mobility to life, and yet all too often, everyone talks about the complicated technological aspects of automobiles rather than just the joy of mobility. TOYOTA has discovered the “TOY” in its own corporate name as the origin of lively and cheerful joy. Then, as part of ToyToyota projects aimed at spreading the joy of mobility, TOYOTA and STUDIO 4℃, that introduced anime, manga, and games to the world. Also introduced are, a leading Japanese animation studio, have together created an animation series, PES (Peace Eco Smile), following a curious alien exploring the joy of driving and the importance of safety. In 2013, TMSM started a new collaboration project, “NEXT GENERATION - PES (Peace Eco Smile) - CROSS COLLABORATION,” to communicate its message globally through producing a full animation film with leading directors and various kinds of collaborations in organic connections with other people, things, and places. For more information, visit <http://www.toytoyota.com/pes/>. Tokyo Otaku Mode™ (TOM) is a worldwide distributor of otaku content; including, anime, manga, cosplay, and otaku entertainment news. TOM is owned and managed by Tokyo Otaku Mode Inc., which was incorporated in Delaware, U.S. in April 2012 by President and CEO Tomo Kamei. TOM began on Facebook on March 24, 2011 as a page for introducing to the world Japan’s otaku content, including anime, manga, games, and goods as well as the latest news and event reports ( http://www.facebook.com/tokyootakumode ). A mere 22 months after the Facebook page was established, TOM surpassed 10 million likes to become the first Facebook page managed by a Japanese company to clear this milestone*. In the fall of 2012, TOM launched its web service Tokyo Otaku Mode β ( http://otakumode.com ), which includes a user-generated content (UGC) platform on which users can upload their own otaku creations––such as cosplay, illustrations, figure photos, and latte art––as well as a news page for delivering to the world the latest news on otaku culture straight from Japan. * According to research conducted by Tokyo Otaku Mode Inc.